Welding is a rewarding career that guarantees you an excellent stable income. If you are interested in this career, you’d be happy to learn that is plenty of welding certification schools in the state. 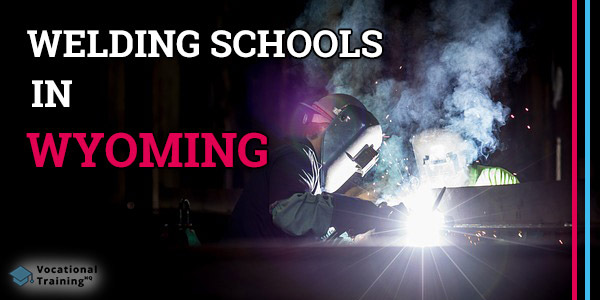 In this article, you can find a list of the best welding schools in Wyoming. There is also a bunch of useful tips and facts for future welders. 7 Where Can Certified Welders Work in Wyoming? Campbell High School is located near Gillette, Wyoming. Carbon County Higher Education Center is a great school that offers welding classes. It provides several welding processes and welding fabrication classes. Central Wyoming College offers an Associate of Applied Science degree in welding. Pathways Innovation Center is a vocational school that provides welding classes in Casper. Sheridan High School offers welding certification classes in Kong Drive. Wind River High School has welding classes Pavillion. Wyoming Welding Tech is one another vocational school that offers welding courses in Wyoming. In the table below, you can find all the necessary info about welding certification schools in Wyoming. Keep in mind that every school was approved by the American Welding Society’s SENSE Accreditation Program. To do it, welders use a variety of tools that heat and melt metal. One another point is that welders should be able to use numerous tools to accomplish their job. To begin with, welding is a rewarding career. Working as a welder, you’ll be proud of the projects you’ve created with your own hands. Also, you’re going to learn something new every day which is absolutely exciting. Moreover, the career has an incredible outlook. According to the U.S. Bureau of Labor Statistics, the number of job offers for welders increases constantly. Data shows that the number of jobs will grow by 6% until 2026. In fact, welders should have a whole bunch of skills and characteristics but, of course, some of them are especially important. Welders in Wyoming can earn a good salary. A median salary of a welder in Wyoming is about $57 380 per year or $27.59 per hour. It’s much higher than a median salary throughout the country which is about $39 390 per year or $18.94 per hour. At the same time, the top 10% of welders in Wyoming earn about $86 660 annually while throughout the country they earn $62 100 per year. Where Can Certified Welders Work in Wyoming? After becoming a welder in Wyoming, you’ll be able to start your career easily. In fact, there is a bunch of spheres you can work at. If you don’t feel like becoming a welder but still, look for something similar, there are some career for you. As you see, there is enough of welding certification schools in Wyoming. Take your time and learn about all the available programs. After it, you’ll be able to choose the one that suits your requirements.